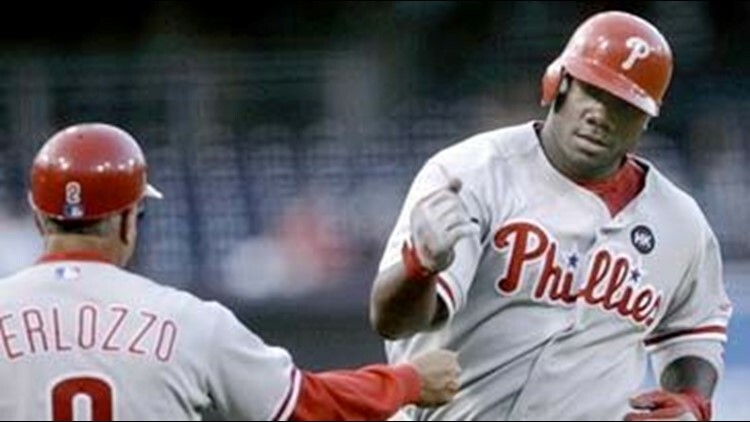 SAN DIEGO (AP) - Ryan Howard hit a two-run homer off Chris Young and the Philadelphia Phillies beat the San Diego Padres 5-1 Wednesday night for their sixth straight victory. It was Howard's second homer of the series and the sixth for the Phillies. Philadelphia swept this three-game series by scoring 20 runs on 33 hits, including 15 for extra bases. J.A. Happ (4-0) held the Padres to four hits in seven scoreless innings, the longest of his eight career starts over two seasons. He struck out four and walked two. Reliever J.C. Romero returned to the Phillies following his 50-game suspension for testing positive for a banned substance. The left-hander pitched 1 1-3 innings, allowing an unearned run on two hits, a walk and a passed ball by Chris Conte. Romero, who earned two wins in Philadelphia's World Series victory over Tampa Bay last year, retired left-hander Brian Giles opening the ninth, then made way for Ryan Madson. Romero pumped his fist and gazed skyward as he walked to the dugout, where he received handshakes from his teammates. The Padres lost for the fifth time in six games. Howard homered to straightaway center fielder with two outs in the first, his 16th. Tony Gwynn Jr. turned and ran to the fence, then watched the ball sail over his head. Shane Victorino was aboard on a double down the right-field line. Young (4-4) allowed three runs and five hits in six innings. Pedro Feliz hit a sacrifice fly in the fourth and the Phillies added two runs against Greg Burke in the seventh, one of them unearned because of left fielder Will Venable's fielding error. Jayson Werth hit an RBI single and Raul Ibanez drove in a run on a fielder's choice. Romero allowed David Eckstein's one-out RBI single in the eighth. After walking Adrian Gonzalez, the major league home run leader with 22, Romero got Kevin Kouzmanoff to line out to shortstop Jimmy Rollins, who doubled David Eckstein off second to end the inning. Notes:@ Victorino left after the top of the sixth with a strained left hip. He will be reevaluated on Friday before the Phillies open a four-game series at the Los Angeles Dodgers. He was replaced by Werth. ... Still fighting the flu a day after the shortest start of his career, Padres ace Jake Peavy said Wednesday that he should be able to make next scheduled start. He lasted only one inning in a 10-5 loss on Tuesday. ... Padres OF Scott Hairston was placed on the 15-day DL with a strained left biceps. Will Venable was recalled from Triple-A Portland and started in LF.